Tried Everything Else, Try Homeopathy. An acronym born of desperation when a deteriorating patient (e.g., with cancer, advanced rheumatoid arthritis, multiple sclerosis or other chronic non-remitting, progressive diseases) is refractory to any form of therapy, thus justifying the use of any measure, however statistically ineffective it might be. The instruments of biting (incisors), tearing (canines) and grinding (molars) of food. There are 20 primary teeth and 32 permanent teeth, but it is common for one or more of the third molars, at the back (the ‘wisdom teeth’) to remain within the gum (unerupted) until well into adult life. The permanent teeth are numbered, 1 to 8, from the centre, in each quadrant. A dentist might thus refer to an ‘upper right 3’ meaning the patient's top right canine tooth. n the propensity of teeth to abnormally move or shift positions within the alveolar bone. This condition can occur as a result of inflammation, metabolic abnormalities, or traumatic injury. n teeth that are opposite each other, one in the maxilla and one in the mandible, that ideally come into occlusal contact with each other. n teeth that are severely worn from erosion or abrasion. n anterior teeth that have been forced to slope outward, usually as a result of pressure from the tongue. n teeth that are at such an angle as to cause them to be out of centric contact with opposing teeth during occlusion. small, bonelike structures of the jaws for the biting and mastication of food. Plural of tooth. See also dental, tooth. see alveolar1 abscess, malar abscess. the permanent molars, so called because they have no deciduous predecessors in the dental arch. teeth with a limited period of growth. usually taken to include incisors and canines. 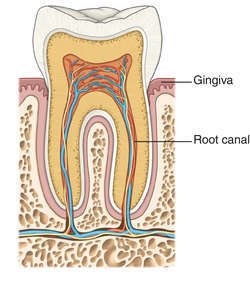 a type of dentition as seen in humans and pigs; the teeth have short crowns, well developed roots and a narrow root canal. See also hypsodont, bunodont. the long, pointed tooth in the interdental space between incisors and cheek teeth; there is one in each jaw on both sides. see dental cavity, pulp cavity. the temporary set of teeth that erupt in the young and are shed before or near maturity. They have smaller crowns and root systems and are fewer in number than the permanent teeth that replace them. Called also milk teeth, temporary teeth, baby teeth. 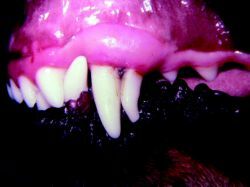 Occasionally, particularly in small breeds of dogs, shedding of the deciduous tooth may not occur when the permanent replacement has erupted, necessitating veterinary intervention. Retained deciduous canine tooth in a dog. occurs in animals on high fluorine intake or on diets low in calcium. 1. grinding of the incisors to improve foraging ability. Has been done to sheep with an industrial angle grinder with indifferent results. a form of dentition, seen in horses and many ruminants; the crown is high (deep), the root is short. one so placed in the jaw that it is unable to erupt or to attain its normal position in occlusion. the front teeth used for cropping grass or rending flesh. From two to four in each quadrant, depending on the species, except that they are missing in the upper jaw of ruminants. cheek teeth with ridged occlusal surfaces. See also lophodont. defective eruption; includes delayed eruption and more usually eruption out of its normal position. the permanent, primary cheek teeth that are not preceded by premolars. They are typically big teeth used for grinding and with ridges on their occlusal surfaces (lophodont) in horses, worn rounded cusps (bunodont) in pigs, or including crescents (selenodont) in cattle, and either cutting edges or flattened areas in carnivores. any small sharp teeth in piglets but principally the canine teeth. caused by staining with porphyrin, or by deficiency of dentine and enamel, a congenital defect. a problem in New Zealand sheep. Characterized by acute then chronic gingivitis, then periodontitis and loss of teeth. Cause unknown. 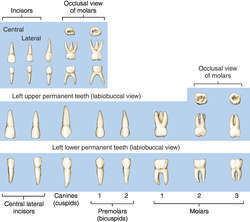 cheek teeth present in both generations, found between the molars and canines. The first premolar is exceptional in humans because it erupts late and is never replaced. In domestic species, there are up to three or four deciduous, followed by up to four permanent premolars in both jaws and on both sides. deciduous premolars or incisors may be retained even though the permanent teeth have erupted. The deciduous crowns are likely to protrude at odd angles and cause difficult mastication. a cutting tooth. See carnassial tooth. teeth with crescents in their grinding surfaces, as in the cheek teeth of ruminants. the edges of molar teeth in the horse which require frequent rasping because of the injury that they might cause to the oral mucosa. red-brown in inherited porphyrinuria in cattle, frequent dosing with tetracyclines, heavy staining with brown tartar in ruminants with a rumination and prehension problem, usually due to loss of anterior part of tongue. teeth in excess of the normal complement, e.g. double row of incisors. Called also polyodontia, heterotopic polydontia. A. i fail to see the connection between teeth and groin pain...about the teeth. it's very very simple- get used to a healthy oral hygiene. brush your teeth in the right way twice a day for at least 6 minute. use floss. go to a dental hygienist, she'll guide you through it. Q. What are wisdom teeth? Why so many people talk about them and suffer from them? A. Wisdom teeth are the third and final set of molars that most people get in their late teens or early twenties. Sometimes these teeth can be a valuable asset to the mouth when healthy and properly aligned, but more often, they are misaligned and require removal. Wisdom teeth present potential problems when they are misaligned – they can position themselves horizontally, be angled toward or away from the second molars or be angled inward or outward. Poor alignment of wisdom teeth can crowd or damage adjacent teeth, the jawbone, or nerves. Wisdom teeth that lean toward the second molars make those teeth more vulnerable to decay by entrapping plaque and debris. In addition, wisdom teeth can be entrapped completely within the soft tissue and/or the jawbone or only partially break through or erupt through the gum. For complete article: http://www.webmd.com/oral-health/guide/wisdom-teeth This one is good also: http://en.wikipedia.org/wiki/Wisdom_teeth Hope this helps.